Dehumidifier Questions Answered by Our Experts! We are often asked about the criteria we use to rate and evaluate dehumidifiers. This dehumidifier guide outlines some of the critical factors we take into account in our evaluations of dehumidifiers plus some suggestions for you. This dehumidifier guide will give you an in-depth view of what we consider when rating and reviewing dehumidifiers for AllergyBuyersClub.com. A dehumidifier that is the incorrect size for the room will not help prevent mold unless the humidity in the room is already at 50% or less. Many dealers only know that a dehumidifier can remove moisture from the air, but they have no idea how to recommend a proper size. If you buy a dehumidifier with too much moisture removal capacity you will be paying for more than you need; however, if you buy one that does not have enough moisture removal capacity the dehumidifier will run all the time and possibly never reach the desired humidity level. At the large warehouse home improvement stores, the only type of answer you will get from an employee (if you can find one to ask) concerning what is the difference between dehumidifiers will be an answer such as “about $50. ” They can do the math but they don’t know what they are selling. AllergyBuyersClub carries a wide variety of dehumidifiers ranging from mid-sized dehumidifiers like the Frigidaire 70 pint Dehumidifier to whole basement dehumidifiers that can remove hundreds of pints of moisture like the DezAir Basement Dehumidifier. Some dehumidifiers are designed for single rooms while others are designed to cover a whole house. 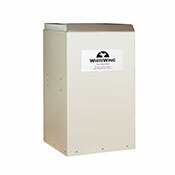 We like the WhiteWing Defender Dehumidifier because it is able to cover a large area and can be installed as part of your existing heating/air conditioning system or ducting to dehumidify multiple rooms. The magic humidity number to achieve is 50% or less because mold cannot grow at humidity levels below 50%. Since going down to 40% can be a waste of electricity and electricity can be expensive, try for a humidity range of 45% to 50%. 50-pint, 70-pint, 90-pint designations refer to the pints of water that the dehumidifier can remove in a 24 hour period under set conditions; it does not refer to the size of the water bucket that is usually only 16 or so pints. Set conditions are rated at 80°F and 60% relative humidity. Since very few homes ever have those conditions, dehumidifiers will actually preform less than their claimed efficiency when operating inside your actual home ambient conditions. Additionally, when manufacturers state that a certain size of their dehumidifier can cover 1000 square feet they are usually assuming ideal conditions and are not taking into account that there are tremendous differences in humidity between areas such as southern Florida and a mountaintop in Colorado. Your outside humidity has a tremendous effect on your inside humidity. Some dehumidifiers will only operate at temperatures about 65°F or they will form ice on the coils (ice up) and shut off the machine. Only those designed to operate below 65°F, called “low temperature” dehumidifiers, are recommended for most basements since the temperature is often below 65°F. Both our Friedrich dehumidifiers and Danby dehumidifiers (pictured) offer low temp solutions. These models have built in “frost guards” or “freeze guards” designed to turn off the compressor as soon as freezing is detected and leave the fan running to blow warm air over the coils. Some of the industrial units use a process called “hot gas defrost” to actually heat the coils and allow them to operate down to 33°F. The Ebac CD30 dehumidifier is ideal for moisture control in cold areas with space constraints. Even if you have a low temperature dehumidifier, while it may not ice up, it may not be able to bring the humidity to the level you want because of the strong correlation between temperature and the ability of a dehumidifier to remove water. The lower the room temperature, the harder it is to remove the water. At 80°F it is possible to reduce the humidity to about 40%, but at 70°F the humidity can only be reduced to about 45%, and at 60°F or lower often only to about 60% unless you have a dehumidifier that is oversided for the room. Many people tell us that noise is a factor when choosing a dehumidifier. Low temperature dehumidifiers tend to be noisier than regular temperature units. All dehumidifiers make some noise due to the fan and compressor but newer models feature new technology which reduce the noise level to a low hum. 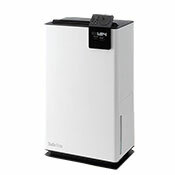 Our quietest low temp dehumidifier is the stylish Stadler Form Albert Dehumidifier . Reliability of any appliance is very important and more so than usual with dehumidifiers. We have found that many models tend to break down after about 18 months or even sooner. Long gone are the days when dehumidifiers could be expected to last 10 – 20 years without a problem. Our experience tells us which dehumidifiers have the lowest return rate and highest reliability rate. Buy a dehumidifier that is properly sized for your specific needs, conditions, and location. Don’t buy one just based on a seemingly low price because in the long run it will possibly cost you more. Position your dehumidifier so that it can get maximum airflow both into and out of it. If you need to place it close to a wall, consider turning it sideways to improve the airflow. Remove and clean the air filter frequently. This filter does little for the air that you breathe, but will stop dirt particles and dust from forming on the condenser coils and reducing the efficiency of the machine. If the filter becomes clogged, it will stop the airflow to the dehumidifier and cause the motor to fail prematurely. Be sure to buy a dehumidifier with a good warranty for repairs and a company that will stand behind the warranty. We have found that manufacturers actually differ enormously when it comes to standing behind their machines. While 1-year warranty on most parts and 5 years on the sealed system is standard, who in their right mind wants to heave a heavy dehumidifier into their car and take it to the local repair center if it breaks down after a short time or requires frequent repairs. Digital humidistats that allow you to set a desired humidity level have an advantage over those with just an adjustable dial, since you have no idea what humidity you will achieve at a position on the dial. This is important to those people who wish to maintain a level of humidity sufficiently low to avoid dust mites or molds that thrive in higher-level humidity environments. Built in hygrometers to measure the actual humidity in the room will save you from having to buy a separate one to be certain that you are maintaining a humidity level of 50% or slightly lower. An automatic shut-off when the bucket completely fills is a must so that the water will not overflow. A bucket to which you can attach a hose for continuous gravity drainage makes the job so much easier. Since most buckets hold between 16 to 20 pints, one of the major inconveniences is emptying the bucket, especially in a very humid environment where this could be a task that needs to be done every few hours. A bucket that is both sturdy and has a built in handle will prevent the irritation caused by a flimsy plastic one without a handle that inevitably causes spilling water on the way to dumping it. Built in pumps are not common, so we sell a convenient Condensate Pump that is capable of pumping the water 15 feet vertically and over 100 feet horizontally should you want the convenience. This way you can have the water pumped to a drain, sink, washing machine out-flow pipe, out a window, through a wall, or even to a different floor. You can actually tie it into your plumbing if you wish. Best of all, it works easily with most all of the dehumidifiers we carry. An automatic defrost with an anti-frost sensor shuts off the dehumidifier when frost begins to build up and avoids frost build up and possible damage to the machine. Automatic restart after a power failure is a plus, especially in a 2nd home where you are not always present, but is not as important in your primary residence where you will notice power outages. Castors are a plus so that the unit can be easily moved from one location to another. Energy Star rated dehumidifiers are efficiently designed to keep your utility bills down. Many dehumidifiers can draw a lot of juice and cost more than your average refrigerator to run if they need to operate for a long time. These two links will bring you dehumidifiers that have been selected with methods mentioned in our dehumidifier guide. You can view them in comparison format on the Compare Dehumidifiers page or easily browse all our models and ratings on the Dehumidifiers page.